A combination of bread and patties turns out to be delicious! Patties and Breads rounds can be prepared a day ahead. Storage: Patties, covered in refrigerator. Uncooked patties can be freeze. Cut 4 by 4 1/2 cm rounds from each slice of bread. Brush rounds with butter. Place them on greased tray, bake in moderate oven for about 15 minutes or until lightly browned and crisp. Spread each round with tomato paste, top with a meat pattie and cheese. 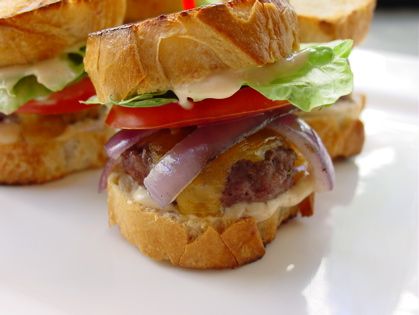 Just before serving, grill burgers until cheese is melted. Combine mince meat, onion, mustard, ginger garlic paste, salt, pepper and sauces in a bowl. Shape 2 level teaspoonw of mixture into a ball, flatten to 4 cm pattie.